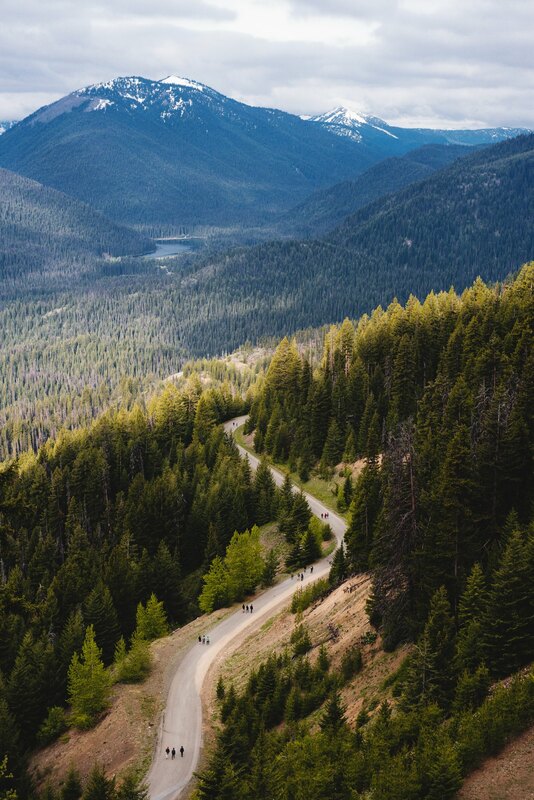 A few weeks ago, Chasing Sunrise, who organize hikes up local mountains to catch the sunrise, put out a call for people to join them on an adventurous mystery weekend. With over 2000 responses, the Sunrise crew randomly selected a mix of 50 applicants, and this past weekend the chosen few ventured into the unknown. As a happy urban city dweller, camping was never my forte. Like many city folk, I enjoy my weekends in the comfort of my bed, with running water and full cell reception. Two days before the mystery weekend, I found out I was one of the lucky few. After many years of avoiding camping at all costs, I was finally going camping. And hiking. 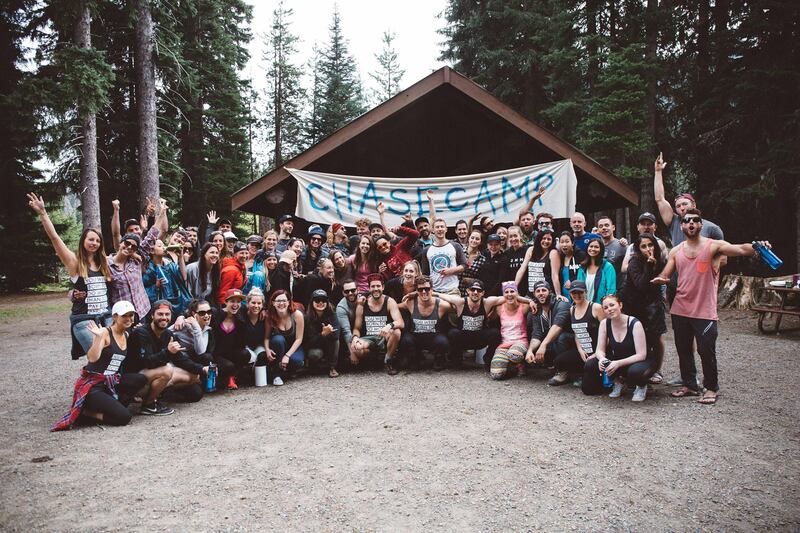 Having returned in one piece, with endless muscle aches and a smile on my face, here are 36 thoughts I had over 36 hours with the Chasing Sunrise gang at “Camp Chase” this weekend. 1. Why are we up so early? The mystery meeting time was 6 a.m. on a Saturday. 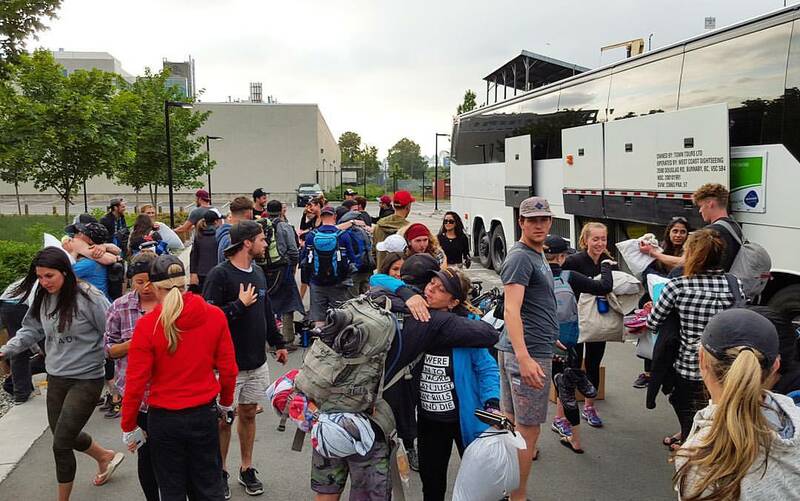 A group of random strangers met in a parking lot, nervous, and not knowing what’s next. Two hours, and zero cell reception into the bus ride, everyone just wanted to get to the mystery spot. Although, making friends on the bus was a good start to the trip. With no phone, no Google maps, it was a guessing game of where we were and where we were off to. 4. What? No way. What? Tents? 5. I have to talk to strangers now. No phone, and no idea how to do anything remotely outdoorsy, I was forced to talk to anyone and everyone who can lend a hand. In a matter of hours, the strangers became my besties. 6. What do you mean by “camp games”? Apparently when kids camp, there are certain games like California Kickball. These rules still apply to adults, and were in full swing at Camp Chase. As a non-camper, I happily gossiped on the sidelines with some new friends. A thought shared by everyone mid-afternoon on Saturday, especially after waking up at 5 a.m. I found out that when camping, the booze is hidden in the lake (aka nature’s fridge). 8. There’s so much time here, what do we do next? Being off the grid give you a lot of time to explore and be social. Thanks to a couple of adventurous guys, I went exploring in the woods, and even walked through some snowy patches without falling. Nature is so crazy! 9. So what’s with campfires? These were all firsts for me. But as the cold hit, I realized this was basically a survival method. And it goes really well with beers. And strangers. 10. The problem with drinking is, you’ll eventually need the bathroom. Outhouses are strange, dark, and stinky. And no, I did not get used to this part of camping. I preferred doing this business in nature – so there’s that. 11. Damn nature, you’re dark at night. Walking around with a headlamp was weird, especially when trying to talk to someone and you both have headlights shining into each others’ faces. “Wait, who are you? I can’t see your face,” is interesting at 2:45 a.m.
12. IT’S 2:45 A.M. DID WE EVEN SLEEP? The answer is no. How do people sleep on the ground? Camping is weird. 13. How am I supposed to hike at 3:30 a.m. without coffee? How are we supposed to do anything at 3:30 a.m.? 14. Oh my. I am hiking and there’s no turning back. Once I started on that 8 k.m. trail up, I realized there’s no turning back. And no coffee. But as cliche as it sounds, I also had the best cheerleaders to keep me going. 15. What’s with this trail though? I’m no hiking expert, but I found it a bit odd that the trail was basically a road. A really long, windy road. Really long. 16 km. round trip kind of long. 16. What am I doing here?! I had this thought a lot. And at one point, when the dawn was breaking, and I had 3 km. left to hike, the thought occurred to me again. I began to see the trees, hear the birds, and turned off my headlamp. I was officially hiking at dawn. It was during the quietest moments, of me and my extremely encouraging hiking bestie, that I realized I have no idea where I am. But also realized, it didn’t matter anymore. 18. I CAN SEE THE FINISHING LINE. Reaching the peak, seeing so many happy people, and smelling coffee were some very rewarding perks to the insanity that occurred between 2:45 a.m. and 5:20 a.m.
19. We chased the sunrise. We actually did it. It’s called “Chasing Sunrise” for a reason. This whole trip was about this moment, and we had just accomplished it. Everything is possible. 20. Can I have some coffee now? 21. Can someone just send us a helicopter to take us back down? I did not want to walk back down. Nope. Not at all. But to get to nap time, I had to. 22. Nap time is a thing at camp. Our big reward was a 9 a.m. nap time on the lake. 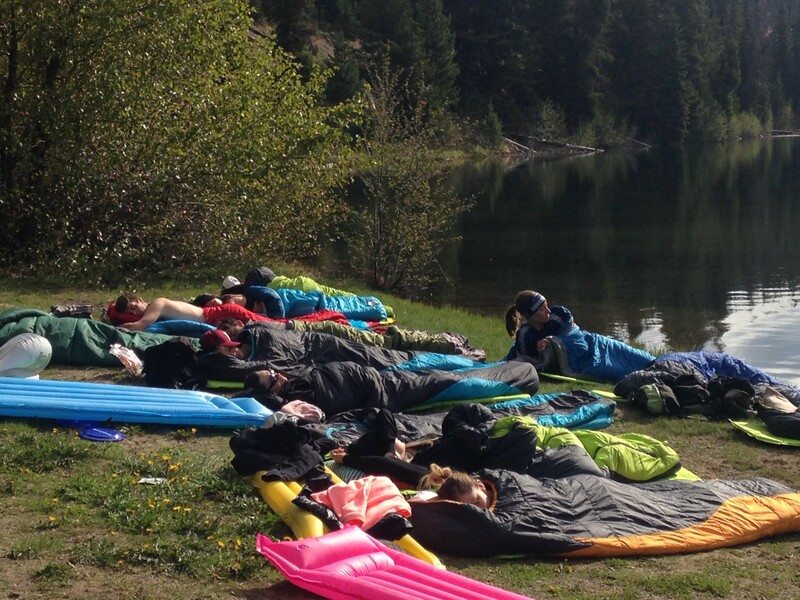 Most people grabbed their sleeping bags and slept on the ground near the lake under the morning sun. I opted for the cozy, warm picnic table. I was done with the cold ground. 23. Hammocks are a great thing at camp. Self explanatory. Bring hammocks when camping. 24. 24 hours into camp life, I still didn’t enjoy outhouses. 25. Camp take-down means learning more outdoor skills. At first I wanted help taking down the tent and folding all the sleeping gear, but then I realized, this ain’t no thang. And ticked one more thing off of my outdoor skills list. 26. “Head’s Up” is the most entertaining game ever. Hanging out lakeside with the group of camp besties, playing “Head’s Up” will continue the bonding experiences. 27. I’m still offline and didn’t even notice. As a person who’s very attached to their phone, there was a moment during Head’s Up that surprised me. I was still offline, off the grid, and I didn’t even care anymore. 28. And the new friends kept on coming. We were basically a bunch of new besties who shared plenty of offline moments that would have been incredible on Snapchat, but were even more incredible in real life. Also, forget Tinder, this was the best way to swipe right in real life. 29. What a weekend of accomplishments! From having to be outgoing, to hiking at a ridiculous hour, to not wearing make up, it was a weekend of so many accomplishments for 50 people. 30. Not all for naught. Someone said that to me at the end of the weekend, and I think it described a lot of our experiences at Camp Chase. 31. Leaving nature without a human trace. Near the end, we all pitched in to leave Manning Park (yes, that’s where we were) even cleaner than when we arrived. The selflessness and team work was evident. What a group of inspiring individuals. 32. Appreciating home, and appreciating nature. If this taught me anything, it is to appreciate my city life, but also to appreciate the beauty of nature and everything it provides. Minus the bugs. 33. What’s the Raptors score?! Having no reception, and as a Toronto native, I was very nervous for the Raptors’ game 7 against the Miami Heat. And happily/loudly announced to the busload back of sleeping adults that the Raptors won by a landslide. Not many seemed to care, but they did wake up knowing this means we had reception again. 34. Why does it feel so sad to say goodbye to the strangers I met yesterday? This to me was more shocking than having to sleep outside. I was a hugging machine once we got off that smelly bus. The smell, a mix of pure joy, lack of showers, and outdoorsy things. 35. What just happened here? At first, there was a lot of hesitation, sweat, and fear. But the end was all about accomplishments. I did it. I survived the 36 hours on this mystery trip with some random people. I camped. I outhouse’d. I hiked and watched that sunrise. It was all accomplished. I did it. 36. This is the beauty of everything that is Vancouver. The organizers, the participants, the location, the sunrise, the local food, the outdoors, everything about this trip showed everything that Vancouver is. This is an incredible city, filled with even more incredible people, and is so close to amazing places immersed in nature. These were 36 hours that showed just how much can be accomplished in one weekend, and in our own backyards. And these were 36 thoughts and reasons to admire Chasing Sunrise, a globally known group of people, and be proud they are Vancouverites. Follow Chasing Sunrise‘s adventures or take part in the next one. You never know where you’ll end up, but know that you’ll definitely enjoy it. Vancity Buzz is a proud sponsor of The Unknown Is Calling.